Last week Yandex hosted its first annual Yandex Expert Summit (YES) in Berlin, Germany. The summit brought together Yandex.Direct certified digital advertisers from around the globe to learn from Yandex’s leading team members. This extensive two-day program included useful talks, master classes, training, and networking that focused on new possibilities of effectively using Yandex.Direct and Yandex Advertising Network, Yandex.Market, Yandex.Metrica and AppMetrica. Yandex created the Yandex Expert Summit to offer advertisers, who have completed expert training, a continuing education on Yandex products and services. The summit is aimed to help attendees improve campaigns and stay informed on the latest launches and updates from those creating them! Yandex regularly hosts Yandex.Direct expert courses in London, Barcelona, and Shanghai, plus yearly courses in NYC and San Francisco. During the course, advertisers learn about the Yandex PPC platform, Yandex.Direct, in addition to Yandex.Metrica, the web analytics tool, the Wordstat keyword research tool, and other products. The courses are run by Yandex expert trainer, Justyna Wilner of Webcertain, who was trained by Yandex and continues to work closely with Yandex staff at the training events and throughout the year. Upon finishing this Yandex two day course, attendees then take a Yandex Expert Certification test to check their level of knowledge and become official Yandex experts. The YES conference welcomed these experts and advertisers which included 150 attendees, representing 96 companies and ten countries, to expand their Yandex knowledge and network with other advertisers. In addition to Yandex, Hurra, Searchmetrics, Lengow, and Kenshoo are all sponsoring the event taking place at Haubentaucher Berlin. Yandex invited its experts to learn from the company’s top managers from a number of departments. Bernard Lukey, executive director of Yandex Europe AG, opened up the event by introducing the Yandex product managers and Yandex expert training partner Webcertain to the audience. YES Yandex speakers included top managers from all Yandex products relevant to Yandex international marketers: Direct, Display, API, Metrica, Mobile, and Money. These speakers shared their knowledge but also asked the audience to give their feedback and experiences with Yandex products. 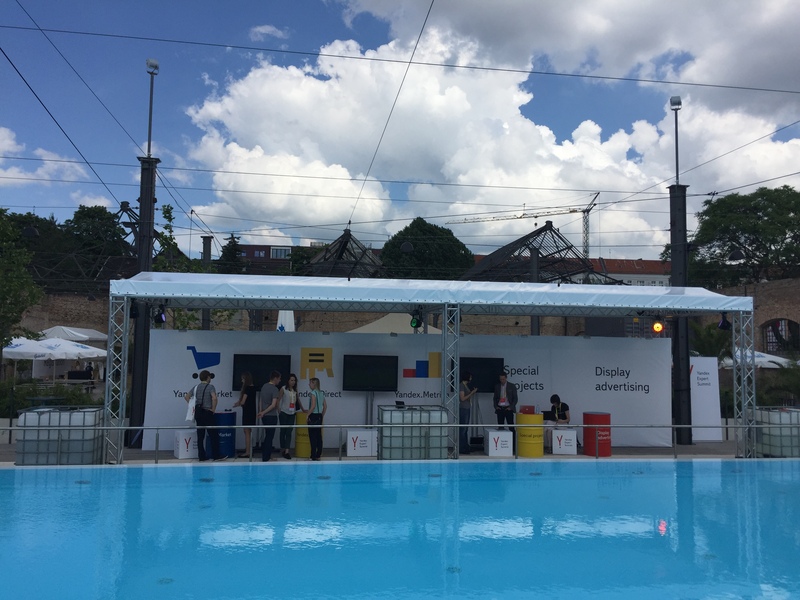 In addition to presenting, Yandex representatives spoke with advertisers during meals and also at designated areas where they stationed themselves to be available for discussions. Yandex speakers and members of teams from Yandex.Market, Yandex.Direct, Display Advertising, and Special Projects mingled with Yandex advertisers asking questions, taking requests, and learning what they can do better for customers as seen below. The YES speakers covered a range of topics throughout the day intended to update experts on the current status of the Russian Internet and advertising market plus all new product features, launches, and developments to help advertisers. Below are key highlights based on some of the best questions, reactions, and feedback from the audience throughout the presentations. Andrey Sebrant, director of product marketing, opened day one with a helicopter view of the digital scene in Russia. Sebrant looked at the current status of Russian Internet market with a few noteworthy distinctions. Mobile as a natural filter: Due to specific behavior and younger demographics of mobile users in Russia, this platform offers advertisers a way to easily filter their audience and targeting. Mobile Internet use is most popular among 18-24 year-old users making up 22% of all mobile Internet users. The 25-34 age range is a bigger portion of the overall RuNet audience and makes up 32% of the Russian mobile Intnernet population. Local values of users: Unlike many other countries, Russian users more heavily rely on local services that make it a unique market for digital advertisers and webmasters. Users turn to Yandex and Google for search, and VKontakte, Odnoklassniki, and Facebook for social networking, but also Yandex services for the majority of their everyday needs like news and taxis. MatrixNet: Machine learning that powers 70% of Yandex products and services, from search to speech kit. As an artificial intelligence company, Yandex uses human generated signals to improve its businesses and customer service. Through this Yandex learns a lot about the Russian audience, driving Yandex personalization for product recommendations and advertising. Yandex can predict and offer Russians users what they want and need. Shopping behavior shifts: eCommerce in Russia is up 16% as more users find the ease, promotions, and development of eCommerce more appealing and trustworthy. Increased promotion and sale hunting: For the most part, Russian users are still spending the same amount of money as they did before the drop of the ruble but now they typically engage in longer planning and online research. In the last year there has been a 37% increase in Yandex queries for promotions. Reduced digital ad clutter & more effective ads: In a 2014 survey, 15% of Russians answered that they like digital ads in general. This rose to 21% in 2016, as ads became increasingly more relevant for users. Not mobile first yet: The mobile Internet audience in Russia has a 20% increase YOY but only 31% of queries are coming from mobile devices. Industries tend to impact the volume of mobile searches, differing slightly depending on the search topics. Following Yandex SEO changes, more websites will be mobile friendly to prepare for this changing environment. June Launch of 1st party segments: In discussing ways to use Yandex.Metrica to develop audience segments, Lomize announced the new 1st party segments that allow targeting by phone numbers and emails from advertisers’ CRM systems. Focus on Personalization: Yandex Smart banner ads (dynamic ads), which are automatically generated from an advertiser’s feed and include content specific ad designs are increasing CTR by 9%. According to Lomize, the ads that were launched in February 2016 are not being utilized enough by advertiser’s and he encouraged the audience to take advantage of this feature. New target audience: Advertisers will soon be able to find similar people outside of their audience “crypt” with a look alike segment. As opposed to standard retargeting, this offers advertisers a great way to find new customers who display qualities that make them similar to the audience an advertiser wants to target. 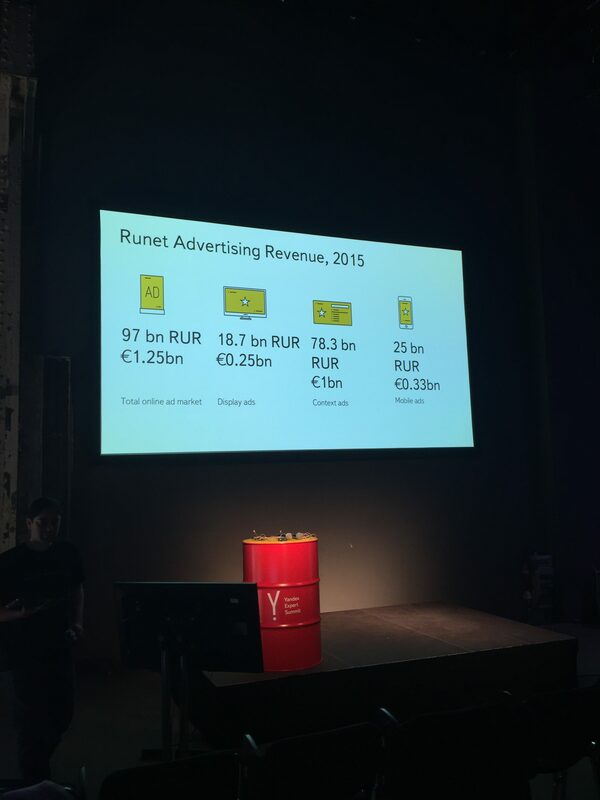 Launch of search retargeting: Yandex will be launching retargeting on search in July 2016. Yandex API differentiation: As an update from the previous 4.0 version, Yandex API 5.0 allows users to update text when creating an ad. Scripts for Agency Accounts: There isn’t a difference when writing script for one customer or agency. Yandex API 5.0 only has points on the customer level, which are used for each customer every day. Granting points is based on customer parameters and the algorithm can work with either more or less points. Creative bids: Outside of the API discussion, the talk led to a few points about creatively using data to adjust bids. For example, writing script according to the weather when sales increase with rainier weather. After writing this script once, advertisers can take advantage of this method to reach their advertising goals. 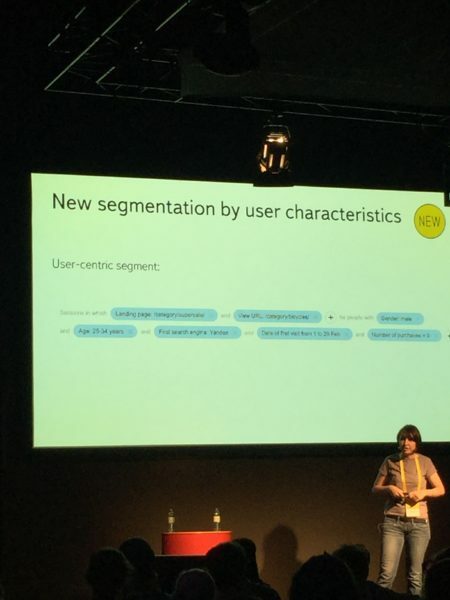 New user-centric segment : A new segment in Yandex.Metrica is based on users characteristics that help webmasters and advertisers specify segments in much more detail. As seen below, multiple features can be included from landing page, url to age group. New data usage for a full scale view of customers: Kulachikova explained how to use customer data from a CRM system with Yandex.Metrica data to better see what is going on with customers. She gave a simple overview on how it works: send userParams in the website code, add CVS/TSV file to data import section, and send via API. Utilizing Webvisor to understand customer behavior and needs: Using a real example of a customers journey searching for a pair of shoes, Kulachikova showed a great example of the way advertisers can use Webvisor to watch customer behavior and learn about ways to convert more. In her example, the customer gave up on an item in a basket when they were forced to register to the website to make the purchase. Webmasters and advertisers need to work together to utilize their data to improve experiences for their audience and increase conversions. 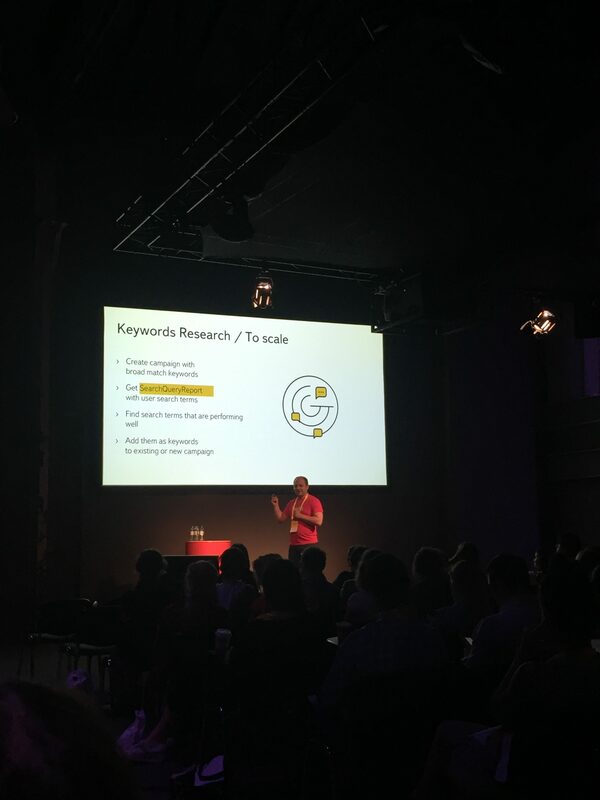 In addition to these highlighted presentations, the audience heard from Yandex.Mobile, Yandex.Money, Yandex Display advertising on programmatic, and was presented with two new case studies. Advertisers learned new tips and tricks while talking to product developers and other advertisers. Yandex was thankful advertisers enjoyed this unique event! Yandex looks forward to implementing customer feedback and hosting YES again! Keep up the good work, Melissa!